SongDoor is open to all amateur and professional songwriters, regardless of nationality or origin. Employees of SongDoor, its families, friends, sponsors, subsidiaries and affiliates are not eligible. 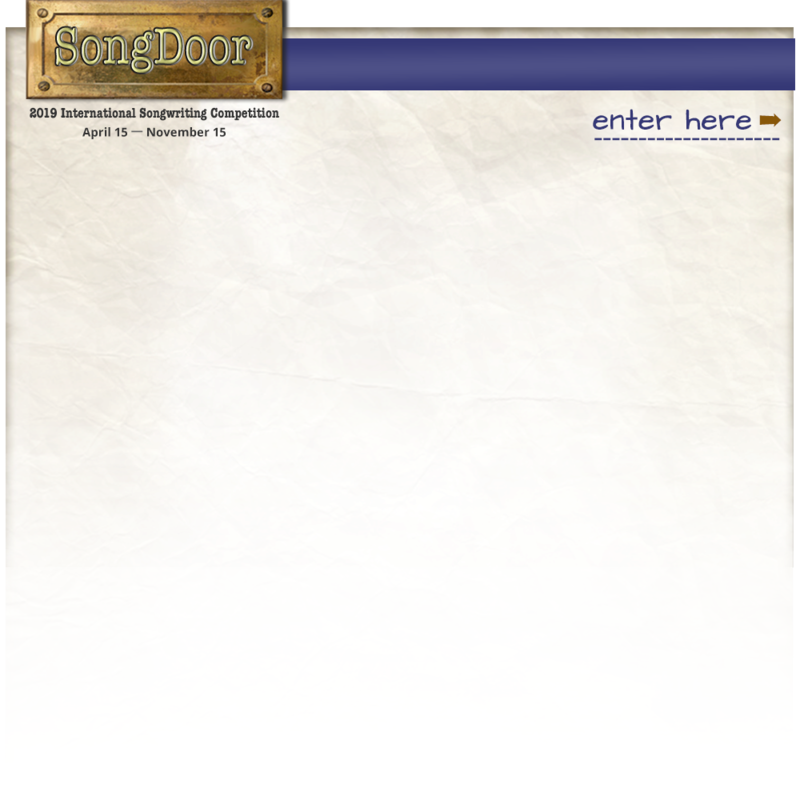 You may not re-enter a song that has been a Category Winner or Category FInalist in a previous SongDoor competition. You must be 16 or older, and have a valid e-mail address. By submitting an entry form to SongDoor, you are agreeing to be bound by the SongDoor Rules established on this page. You MUST assign a category to your song. If you’re not sure where your song belongs, please check here for examples of each category. You may enter as many songs as you like. You may enter multiple songs in one category, or you may enter the same song in multiple categories. Each form allows for 3 entries. Just repeat the entry process if you have more than 3 songs to enter. You retain ALL ownership rights to songs you submit. All entries must be original songs and shall not infringe upon any copyrights or any other rights of any third parties (no sampling or plagiarism). Songs may have multiple co-writers, but only one name should be designated as the entrant. As the entrant, you indemnify and hold SongDoor harmless from and against any claims inconsistent with the foregoing. All finalists' songs and the six winning songs will be available for listening only. Downloading will be blocked to protect you. Entries will be screened by the SongDoor staff, and the finalists will be sent to the judges, who will decide on the winners in a strict blind judging process. Songs are judged equally on originality, melody, composition/structure and lyrics (except in the Instrumental category). The performance and recording quality will not be considered; this is all about songwriting. Here are some tips for getting the judge's attention. ALL entrants in the SongDoor competition receive a free 45-day all-access trial at SongU.com (a $50 value) plus a free Broadjam Film & TV membership (valued at $100) and free songwriters' software for either Mac or Windows (valued at $70). There is no obligation, no membership or sign-up of any kind. Information about accessing these tools is emailed to all entrants within a week after the competition is over at the end of January. We are not responsible for undeliverable e-mail addresses, so make sure you tell us if your e-mail address changes after you submit your entry form. Finalists will be announced January 8, 2019. The Grand Award winner and the six Category Winners will be announced on January 22, 2019, along with the Honorable Mentions. We will make every effort to adhere to these dates, but will not be liable for unanticipated delays. All winners will be notified by email and/or phone, and their names and song will be posted on this website for a full year. Grand Award winners are immortalized on the Winners page for all time. By entering this competition, all winners agree to the terms of the online submission agreement, which constitutes permission to use the winner's name, song, endorsement and likeness for future publicity purposes without additional compensation. All federal, state and local taxes, and customs fees, when applicable, are the sole responsibility of the winner. SongDoor will not pay any winners' taxes or fees and is not liable for any damages sought by entrants or others. All awards will be given to the primary entrant on the entry form; the division of awards amongst co-writers is up to the winner. Multiple awards are not given to winning songwriting teams, although personalized Certificates of Excellence are mailed to the entrant for distribution to all co-writers. The Grand Award winner will receive merchandise and/or services valued at up to USD $4,160. Each Category Winner will receive merchandise and/or services valued at up to USD $1,356. It is the responsibility of sponsors to provide the awards or offer a comparable substitute if for some reason a promised award becomes unavailable. Awards will be sent out promptly after the announcement of the winners and the Grand Award studio demo will be scheduled for the earliest possible date; the winner may participate in the demo if it is within the parameters of the studio process and the time allotted for the session. If the winner chooses to participate, he/she is responsible for all expenses pertaining to travel, accommodations, meals, etc. The winner’s attendance at the demo session is strictly voluntary. If the winner does not participate, the final demo will be emailed to the winner. Category Winner demo musicians and vocalists are at the sole discretion of Steve Avedis and his staff. Should a Category Winner wish to bring in a different musician or vocalist, all financial responsibility for that work-for-hire is borne by the Category Winner. If a winner has not received any portion of his/her award by March 30 of the award year, and has not responded to SongDoor attempts to confirm delivery, SongDoor will no longer be responsible for the delivery of the award. All winners agree to release sponsors and Songdoor from all liability regarding awards won. These rules are subject to change at the discretion of SongDoor and its agents.